Considering the dirt cheap price and ease of making, it’s no surprise to see ramyun stocked in most Korean households. 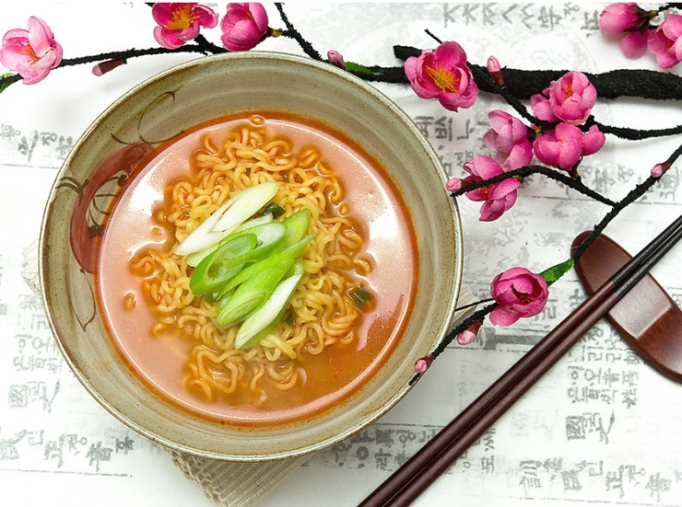 The methods and ingredients people use can vary greatly, but either way you can’t really mess up ramyun. If you do, put out the fire in the kitchen and take a gander at this super simple step-by-step guide. That’s right genius, you need to have boiling hot water to begin the process of making a delicious 1,000 won dinner (SGD$1) comprised of Shin Ramyun. Instead of boiling water in the pot and watching paint dry, opt for a quick boiler. All it takes is the press of a button and voila! You’re ready to go. Some people prefer to hold off on throwing the luxurious seasoning packages inside and instead wait for the noodles to soften up a bit. If you choose to do this, it could be easier to break up the noodles a bit as this will speed up the process a bit. There are also the naysayers who say throw in the seasoning and any other spices that you would like to add in the moment the water starts to boil. Supposedly this enhances the flavor of the soup and also helps ensure that the noodles don’t become soggy. Others add the ramyun in at the last moment after the soup and all assorted vegetables and meats are ready to go. In either case, a bag of noodles runs less than 1,000 won (SGD$1) so get your Bill Nye on and experiment to see which you prefer first. This is a pretty universal step, as ramyun without eggs is like munching on a hot dog without ketchup. Well, unless your last name is Kobayashi and you’re trying to devour 60 hot dogs in a minute that is. Remember to keep stirring the noodles as they tend to clump up together in the soup. This is also a very popular step in the process. You may have tried budaejjigae at one point or another, but we won’t get into that here. Any hot dog type of meat will do, and some ramyun aficionados add ground beef into the equation. The great thing is, just about anything will do. This one is up in air but is used by those who enjoy manduguk, which is dumpling soup. The more the meat the better though, no? Sriracha sauce is also a common culprit found in soup, but any hot sauce will do. If you are still holding on to those taco bell hot sauce packets that you stole a long time ago, now’s the time to use them. Hopefully you have some bowls and spoons around to serve your guests as eating the ramyun like a nearly empty bowl of cereal is not advised unless you want a fire in your mouth. Many people opt to enjoy it with some kimchi or danmuji, a pickled yellow radish. In either case, bon appetit.